You want to MAKE money, right? As a small business owner, did you know that trying to do everything yourself costs you 40 to 60% in lost revenue? Yup, it’s true. According to the U.S. Small Business Administration (SBA), the average small business owner spends up to 40% of his or her time on administrative work. This may even be on the conservative side as some business owners who have tracked their time for a week or two have been shocked to discover they were actually frittering away a whopping 60% (or more) of their own time on administrative work. Administrative work is absolutely vital—it’s what keeps your business organized and humming along smoothly. But that doesn’t mean you should be the one doing it. As the business owner, 80% of your time should be focused exclusively on planning, strategizing, marketing and development, not to mention working with clients if you provide a professional service. Doing your own administrative work cuts into the time you have to devote to those core revenue-generating areas. If you don’t have the skills and resources to do that work well, it will take you longer. If you don’t like doing certain things, you’ll keep putting them off, creating more and more backlog. All of which ends up zapping your energy and wasting precious time and resources, not saving them. The good news is that you can grow your business beyond where it is today with just a bit of strategic support. The more administrative, non-core, energy-draining activities you can eliminate from your plate, the more profitable, streamlined and successful your business can be—and the more time you’ll have for life! You might be asking yourself, “Why would I pay someone else to do administrative work I can do myself? Seems like it would be easier and cheaper to do that work myself.” The operative word here is “seems.” Because in all honesty, trying to do everything all by your lonesome actually exacts a heavy price in your business, far more than you realize. Just because you can do something, doesn’t mean you should. Here are just some of the best reasons to work with an Administrative Consultant. More energy. You waste vital energy trying to do everything yourself. Energy is a finite commodity that comes at a premium when you are running a business. If you spend it all on back-end work, it will deplete the reserves you have for creativity, brainstorming, marketing, developing your business and working with clients. More time. You have better things to do as a business owner than trying to take care of your own administrative work. When you allow an Administrative Consultant to shoulder some of the burden, you can multiply exponentially the time you have for business development, working with clients, marketing and networking, creating new products and services, and taking time off to recharge and live life. Better focus. Trying to take care of every detail yourself keeps you distracted and overwhelmed. Don’t do that. Hire key partners, such as an Administrative Consultant, to help shoulder the load so you can keep your eyes and mind on your goals. Faster progress. You can’t be a master of all things. Not to mention the fact that if you don’t excel at certain work, it will be harder and take you longer to accomplish. You will get so much more done, far more quickly, working with an Administrative Consultant than you would trying to do it all by yourself. Reduced stress. Trying to juggle every single ball, all by yourself, is at the root of stress and burnout. Guaranteed. Working with an Administrative Consultant will make your life peaceful again. Easier business. When you have help and someone who can advise and help you improve and streamline your systems and operations, you're business becomes so much simpler and easier to run. More resources. Two brains are better than one. When you partner with an Administrative Consultant, all of that expert’s knowledge, expertise and resources are lent to your business. You create a smarter, stronger business foundation as a result. More money. When you have more time, energy and focus to devote to working with clients, marketing, and developing your business, you can concentrate on revenue generation and making more money. It’s as simple as that. The bottom line is that you squander more than you save by trying to do it all yourself. What you gain in time, energy, ease and progress will always be greater than any fees you pay for a competent, expert Administrative Consultant. You start by seeking the service of an administrative expert, of course! 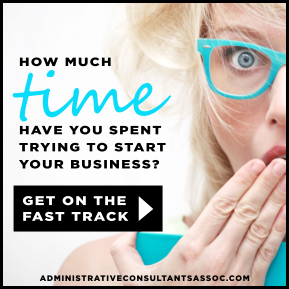 Find an Administrative Consultant today and go from struggling by yourself to getting things done and enjoying more time, freedom and success.